An AIS-equipped system on board a ship presents the bearing and distance of nearby vessels in a radar-like display format. Information provided by AIS equipment, such as unique identification, position, course, and speed, can be displayed on a screen or an ECDIS. AIS is intended to assist a vessel's watch standing officers and allow maritime authorities to track and monitor vessel movements. 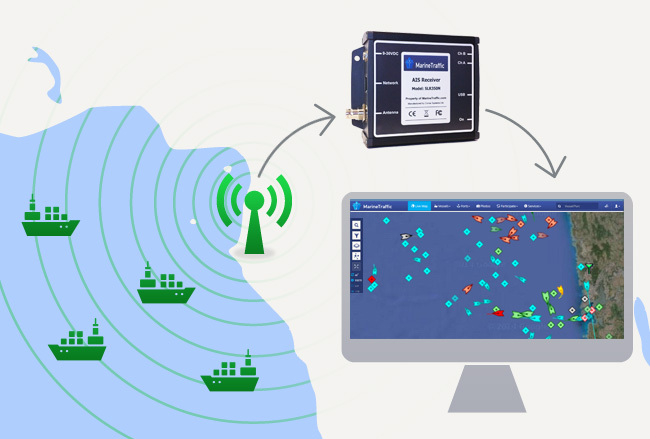 AIS integrates a standardized VHF transceiver with a positioning system such as a GPS or LORAN-C receiver, with other electronic navigation sensors, such as a gyrocompass or rate of turn indicator. Vessels fitted with AIS transceivers can be tracked by AIS base stations located along coast lines or, when out of range of terrestrial networks, through a growing number of satellites that are fitted with special AIS receivers which are capable of deconflicting a large number of signatures.